Why do you need to offer consumer financing? Consumers have been steadily financing more and more of their large purchases over the past couple of decades, everything from furniture to cars. More significantly, they now expect to be offered the opportunity to finance any major purchase they consider. When it’s time for a new heating and cooling system, regardless of the reason, odds are financing is going to play a significant role in their purchase decision. 85% of the “top 4 purchases” are financed. The top 4 includes houses, college, cars and home improvement. So with many potential customers, if you’re not offering consumer financing, you aren’t just missing out on the sale; you’re missing out on the entire sales call. If you can’t even get an appointment with a customer, your skills, expertise and pitch won’t matter. How does financing benefit your customers? Financing a new heating and cooling system allows customers to keep more cash on hand. They can spend their cash in other places or save it for emergencies. Financing also allows them to afford not only the system they need, but the system they truly “want.” Instead of an entry-level system, they can now afford a high-efficiency system with more accessories—a heating and cooling system that truly meets their needs. How does financing benefit contractors? Gain consideration by a larger group of consumers. Customers who need financing won’t consider a contractor who doesn’t offer it. Sell more high-efficiency equipment with more accessories. Customers can afford “more system” with the aid of financing. Increase your close rates. Financing can be the one key factor that closes the sale. Experience better cash flow—you get paid quicker. Like many things, there is an art to offering financing. 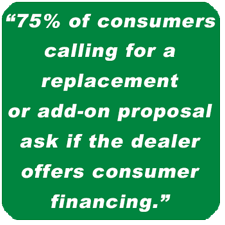 Most of your customers want or even need financing, but many will not want to ask about it. It is a best practice to offer financing from two types of institutions, “primary” and, if primary options are not available to the particular homeowner, a “second look” option. Wells Fargo Retail Services is a great primary choice. Wells Fargo provides traditional financing services for creditworthy customers. Microf provides a great second look financing option. Microf offers rent-to-own options for residential heating and cooling customers with no credit check required. Microf allows you to offer financing to customers who cannot get approved through Wells Fargo or other traditional financing institutions. If you are not ready to offer two choices, start with Wells Fargo, then you can add a second look option at a later date. It is important to implement a sound financing strategy to clearly communicate your financing program to both your internal team and customers. Plan to offer financing on every job and set goals to increase the percentage of financed jobs. The best heating and cooling contractors finance 80% of their jobs. Why finance so many jobs? It’s simple—customers spend more with financing. 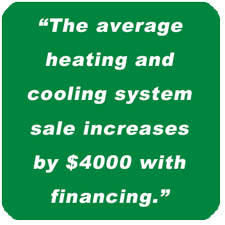 The average heating and cooling system sale increases by $4000 with financing. The best heating and cooling contractors increase their average system sale by an amazing $6000! Plan to attend BDR’s Art of Consumer Financing class to learn advanced strategies for offering choices in financing as well as how to make sure you are covering the costs of financing. Click here for more information. Make it easy for customers to finance. Discuss financing at every point in the sales process. Don’t make the customer ask for it. Highlight your financing offering on your website. If customers can’t see it, you may lose the opportunity to quote their project. Make sure to include a link for customers to get pre-qualified ahead of time. Add financing to your phone scripts and on hold messages. Anyone who answers the phone in your company should be thoroughly educated and completely sold on your consumer financing offering. Financing may be the first question a customer asks about. Prior to the sales appointment, the salesperson should know if the homeowner has expressed an interest in financing so they know how to discuss financing options during the appointment. Prior to the installation, the technician should know if the customer used financing and the available credit remaining on their financing approval. Knowing this information allows the technician to suggest accessories that match the customer’s payment terms. Become an expert in your financing programs—Wells Fargo as a primary option, and Microf as a secondary option. Master enrollment requirements, application processing, and the acceptance and funding process. ► T – Train your team how to effectively position financing when interacting with consumers. ► I – Identify financing program roles and responsibilities for each of your team members. ► E – Educate your team on your financing programs and get them excited about the opportunities for themselves and your customers. Set goals and track results. Target an increased percentage of financed jobs, increased average sales and increased accessory sales. Periodically review your cost of financing (at least quarterly) and adjust if necessary. Setting goals is critical to anticipating and accounting for the increased costs from offering financing. As the owner, you must be the biggest believer in offering financing. Understand your financing programs. Communicate the benefits of financing to get your team excited about the opportunity. Be the “Financing Champion” and make it part of your company culture. Click here for information about participating in the Wells Fargo Retail Services program. Click here for information about the Microf product offering. Michael Hunter has more than two decades of experience in the HVAC industry spanning multiple roles in distribution, as a territory manager and as the highly successful general manager of a business in Idaho. He is now a trainer and coach for Business Development Resources (BDR) who leads classes like The Art of Consumer Financing and Foundations for Profit & Growth. 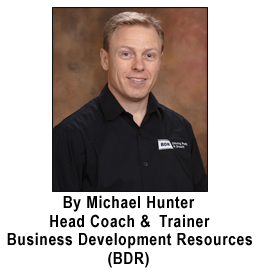 BDR is the premier provider of business training and coaching services to HVAC contractors. BDR is an authorized training provider for International Comfort Products.